I have now clear coated the vintage steel fork which was part of the 1940s/50s Mercier Meca Dural I have been working on for the past year. The bicycle was mostly original, with its beautiful aluminum frame in fantastic condition. Unfortunately, the fork was terribly pitted, made worse by the application of an amateur spray paint job. 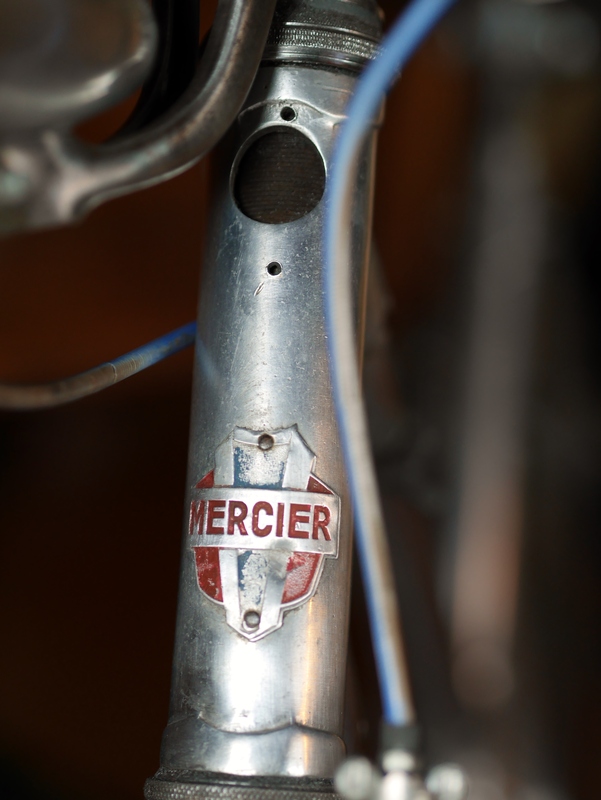 This Mercier Meca Dural bicycle was built in the late 40’s or early 50’s. 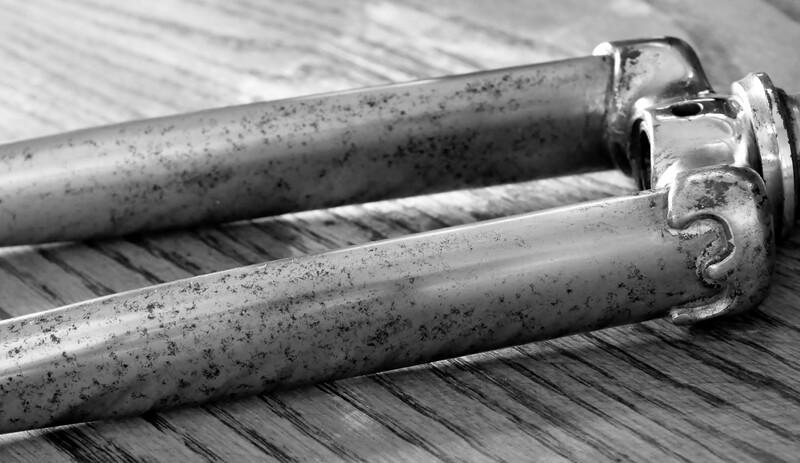 The main tubes are made from “duralumin” – the same stuff blimps were made from. The forks on these bicycles were always steel, and in this case the fork had probably been originally painted gray or was chromed, to match the color of the unpainted aluminum on the main tubes. Because the main tubes cannot rust, there was no need to paint them. 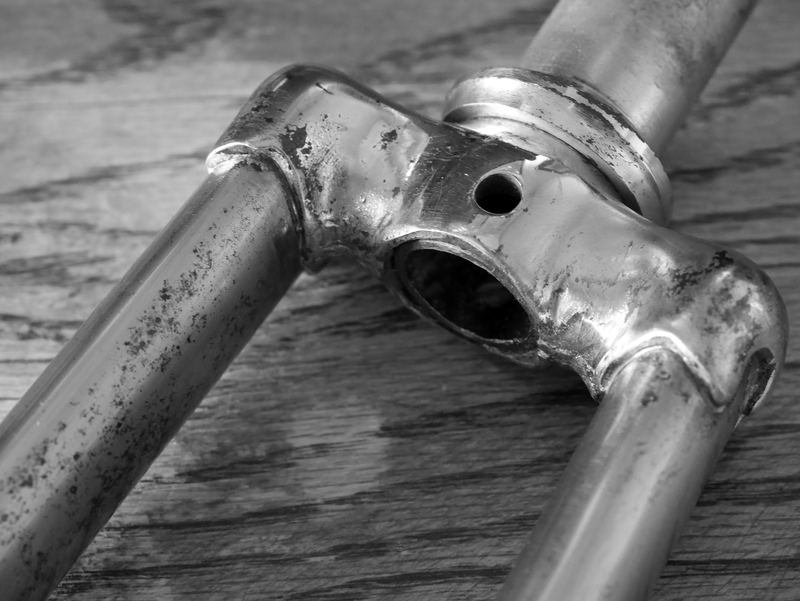 But, the original fork was compromised – it was pitted with corrosion and rust. I needed to decide how to restore it or replace it. After many hours of paint removal, sanding, and polishing, the fork looks much better. I became concerned about removing too much material from the fork blades, so I finally tossed in the towel. On the bright side (pun intended), I guess you might say this fork has patina in spades. I ended up deciding that I wanted to clear coat the fork (for now) rather than chroming it or sending it out for a professional paint job. That would enable me to continue restoring the bicycle, which I am anxious to complete. I decided to use Proctaclear by Everbrite for the paint, and MAAS metal polish for the final finish work prior to painting. Both products worked very well. 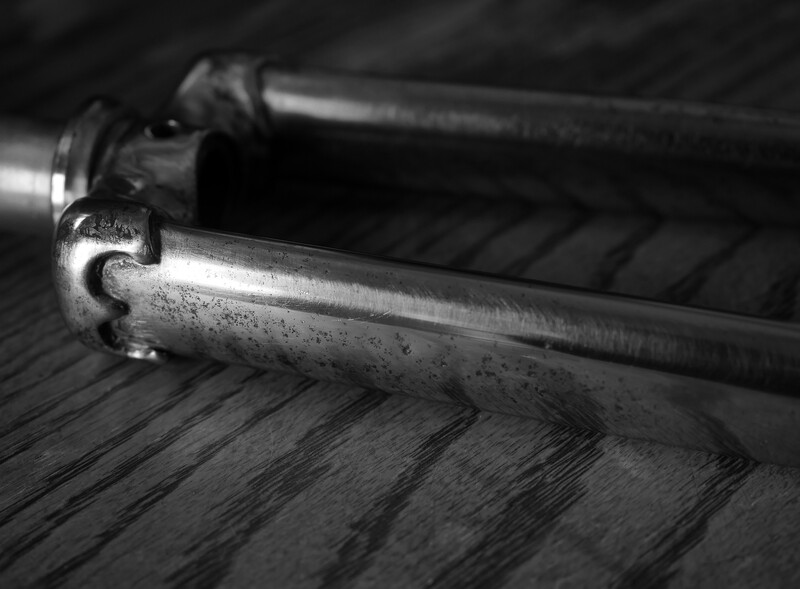 I polished the fork blades and crown with MAAS metal polish – this took hours! However, I really like this polish and will continue using it for steel parts. It’s not as good as NevrDull on aluminum fenders, but can make even funky metal parts look very nice. 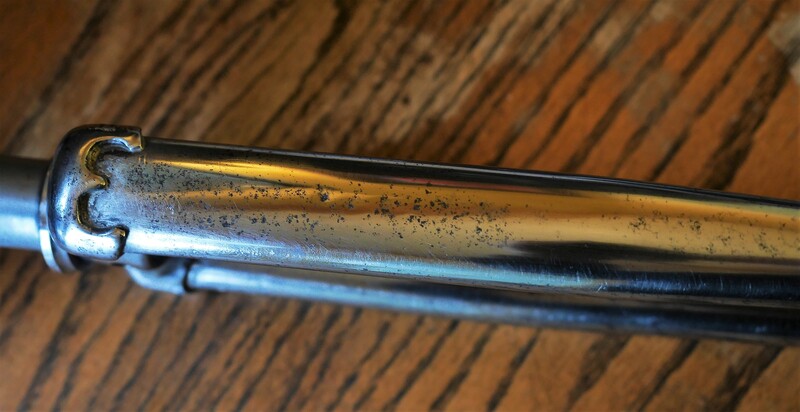 After polishing, I cleaned the fork blades with alcohol and a soft cloth – I didn’t have to use an acid neutralizing baking soda bath, because as advised by the Protectaclear instructions, MAAS polish does not contain acid. However, some restorers do this process anyway, regardless of the polish used. I did a final wipe down on the fork blades with a tack cloth – to remove any debris from the surface. I cleaned the paint brushes and prepared my work area so that I could avoid fouling the brushes on an unclean surface. I put the fork upright in my work stand so that the paint would flow downward. 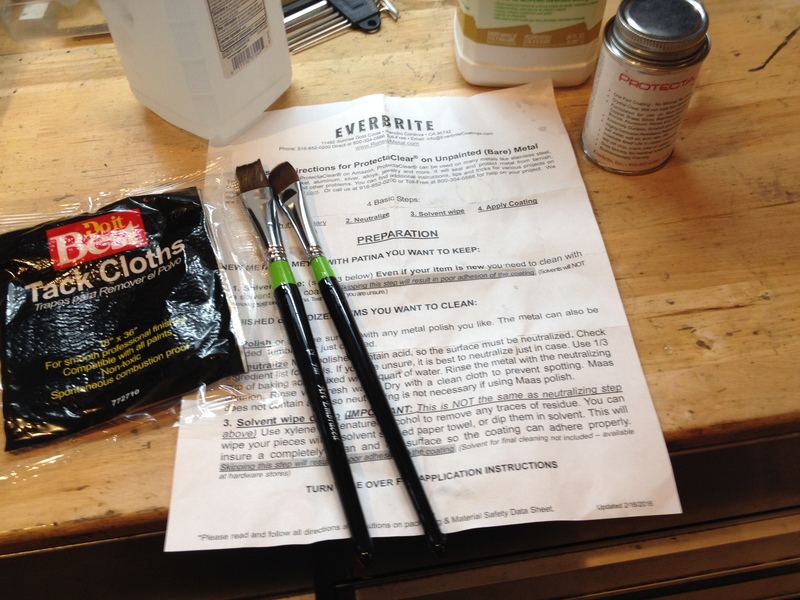 My paint brushes were new, so I only needed to wash them in warm water to remove their protective coating – however, see below. 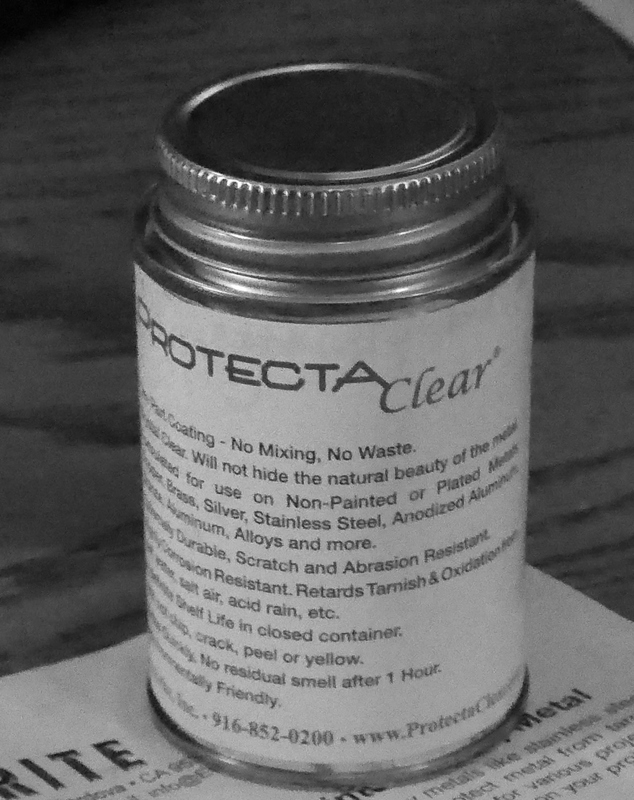 I poured a tiny bit of Proctectaclear into a clean glass jar – this stuff goes a long ways. The small container I purchased could probably cover 2 bicycles in full. I painted the fork blades with smooth, even strokes. The paint went on easily, and as the instructions advise, the paint will naturally smooth itself out on the surface so that you won’t see any brush marks. This was an accurate description, and the painting itself took no time at all. However…see below! As I was painting, tiny surface anomalies began to appear in the painted surface. At first I thought the paint was reacting to something on the fork blades, but then I realized that my paint brush was depositing little particles onto the blades. The new brushes still had some leftover protective glue which I thought I had washed off. I then stopped painting, cleaned the brush extensively, then wiped the brush with tack cloth, and that solved the problem. I had to carefully remove the tiny particles with my fingernail (gloved) and then smooth the paint out again. After a couple of hours, I applied a 2nd coat, as provided for in the instructions. The paint cures hard in 4 – 5 days. It is very soft prior to this, and even scuffed a bit when I laid the fork down on a wood surface about 24 hours after the final paint coat. 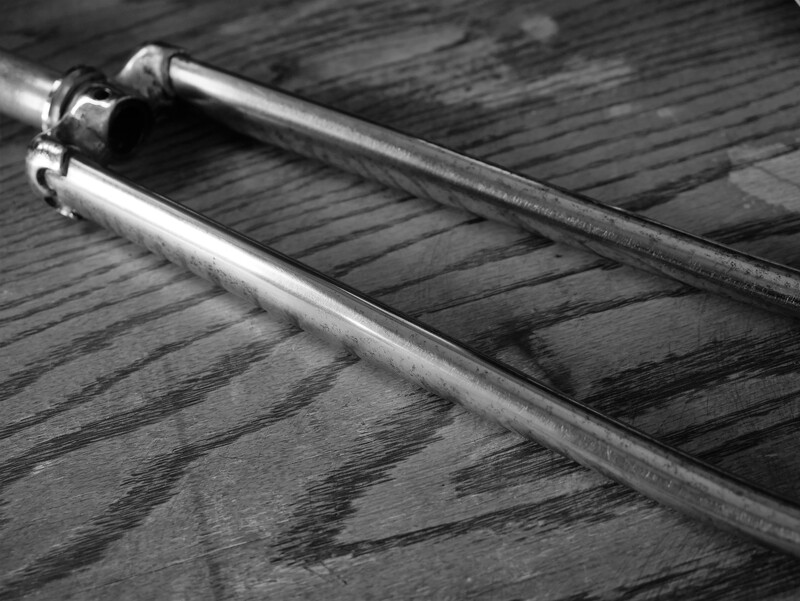 The painted fork looks pretty much exactly like the raw steel fork. It really is a clear coat. I will know soon just how robust the paint is, but for now I am excited to begin building up the frame and completing the restoration. The whole process to restore this fork took well over 25 hours. Rather than following the typical 80/20 rule for paint jobs (80% preparation time, 20% painting time), this job was more like 99%/1%. The painting portion of the work was almost a let down, because it was really so easy compared to all the other work involved in preparing the fork. I’ll plan to do a long-term update once the Mercier Meca Dural is restored and back out on the road. 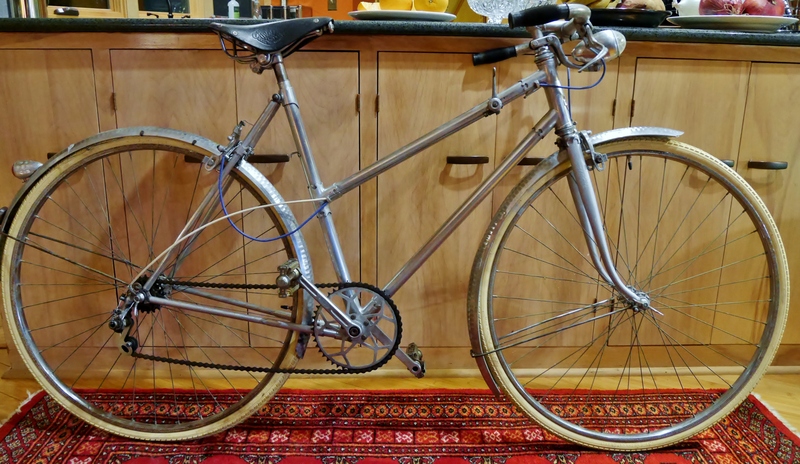 This entry was posted in Bicycle restoration, Meca Dural, Mercier, Vintage bicycle restoration, Vintage French Bicycle and tagged bicycle restoration, clear coat bicycle frame, clear coat steel, duralumin, French bicycle, Meca Dural, Mercier, vintage french bicycle by Nola Wilken. Bookmark the permalink. Thank you, Jim. The pure pleasure of it all keeps me going. I like the cable routing for the derailleur. These bikes were sold with their frames unpainted? I wanted to ask you why you didn’t mention anything about using a primer on the fork. Hi Paul, these vintage aluminum frames were typically unpainted. The frames cannot rust, so there is really no reason to paint them. 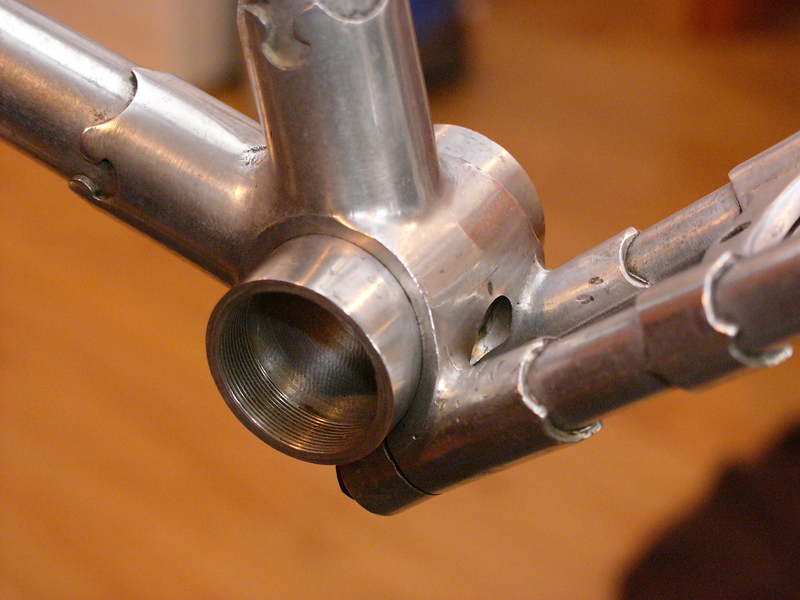 Instead the tubes were polished. Meca Dural frames typically used steel forks which were painted in the usual fashion. This fork was probably originally painted grey to match the aluminum tubes on the bike, but over the years the fork corroded and some idiot spray painted over the corrosion. Painting a steel fork always involves a primer for rust prevention. Except in the case of clear coating. That is why most builders do not recommend clear coating a steel frame. 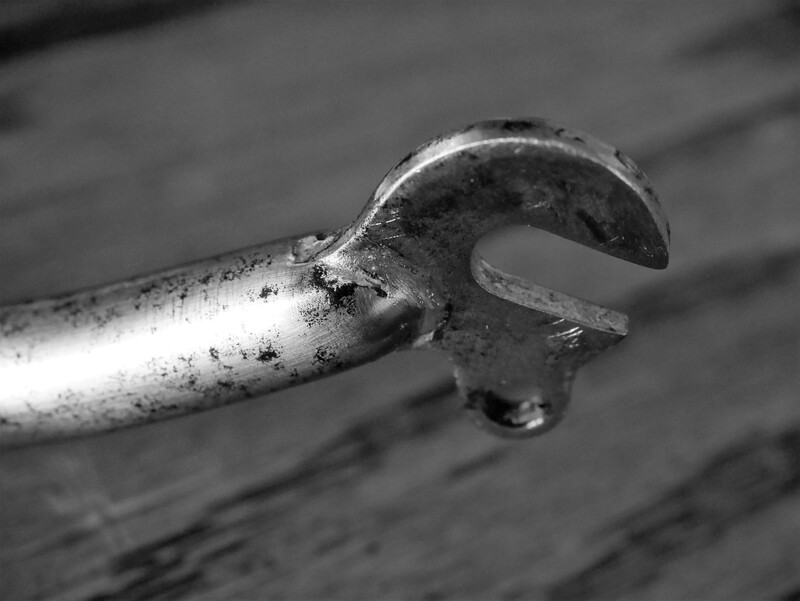 The primer coat is a critical element of rust prevention. 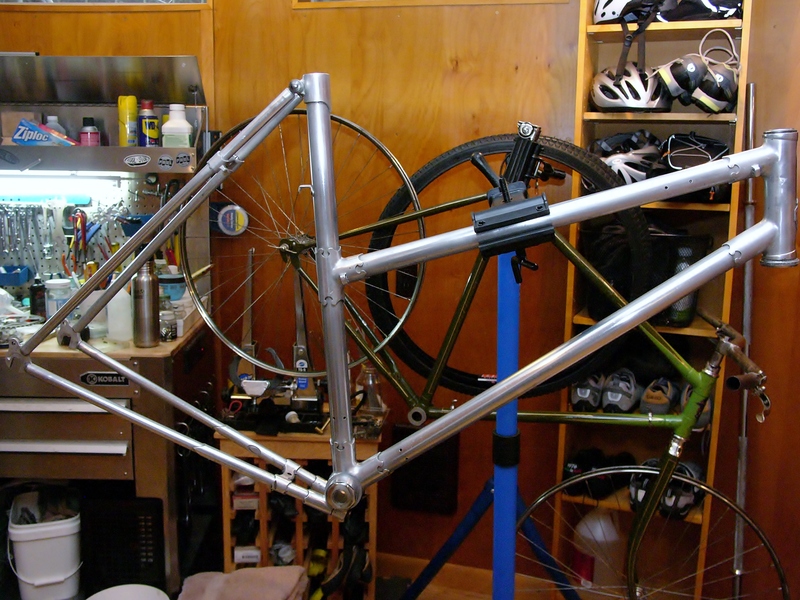 For this restoration, I decided to clear coat the fork as an interim solution. 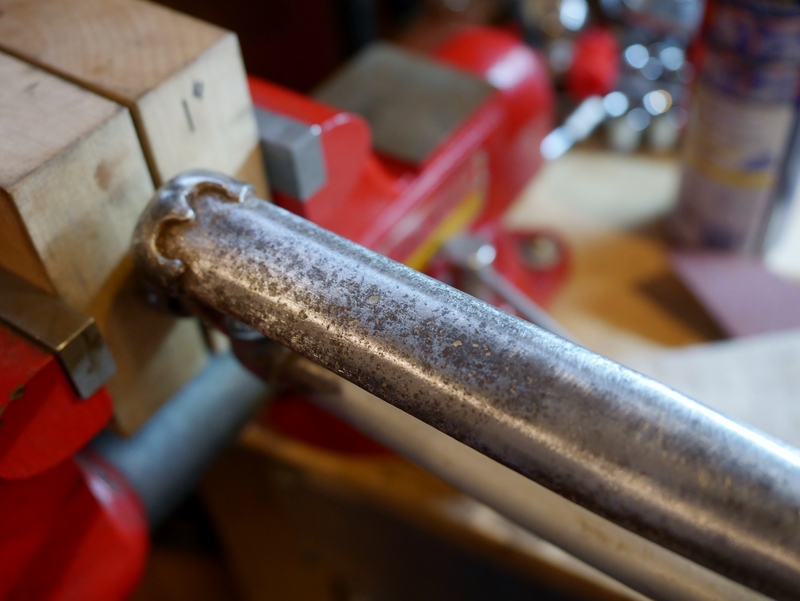 It is not an ideal coating for any steel bike that will be ridden frequently.